Yum! 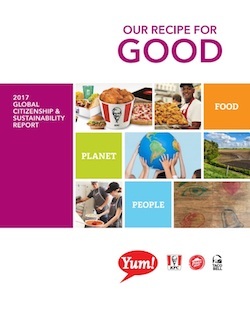 Brands, Inc. (NYSE: YUM) today released its 2017 Global Citizenship & Sustainability Report, citizenship.yum.com, highlighting the company’s progress in 2016 and 2017 and outlining efforts by KFC, Pizza Hut and Taco Bell to make a meaningful impact in three areas of strategic focus: Food, Planet and People. The content of the report reflects topics identified through Yum! Brands’ first companywide materiality assessment and progress against its existing public commitments. The report is prepared according to Global Reporting Initiative Standards, the most widely recognized framework for sustainability reporting. KFC: As a brand that’s Always Original, KFC is focused on ingredient sourcing that ranges from sustainable palm oil to purchasing chicken raised without antibiotics important to human medicine in its U.S. restaurants by the end of 2018. The brand has created a customized green building program for its restaurants and invests in its restaurant team members with various training and development programs as well as educational partnerships globally. Worldwide, KFC donated 3 million meals last year to more than 1,500 charities through the Harvest program, and restaurants raised over $14 million (USD) to benefit more than 35 charitable organizations that fight hunger and promote growth opportunities for youth. Pizza Hut: Known for its iconic pizza innovation, Pizza Hut is redefining the modern pizza delivery experience. Pizza Hut offers a variety of crusts, sauces and customizable topping combinations including fresh vegetables, proteins and fruits and has eliminated partially hydrogenated oils from its global menu. In the U.S., the brand became the first national pizza restaurant to remove artificial flavors and colors from its core pizzas and WingStreet products, and it extended its commitment to serve chicken raised without antibiotics important to human medicine in its WingStreet wings by 2022. Through its global waste reduction efforts, Pizza Hut reached a significant milestone in 2017 – donating 100 million pounds of food over the years through the company’s Harvest program. The brand also expanded its commitment to literacy in 2016, launching its signature platform, Pizza Hut: The Literacy Project, which in its first year impacted 15.9 million people across Brazil, Canada, Costa Rica, South Africa and the U.S. through initiatives like the BOOK IT! Program and in-restaurant fundraising. Taco Bell: As a brand that’s in a Category of One, Taco Bell has been on a Food for All journey, creating a menu that offers the choices its consumers are asking for. For example: offering choices that are low calorie/fat, high protein and vegetarian; removing artificial flavors and colors, high fructose corn syrup and partially hydrogenated oils; reducing sodium; serving chicken raised without antibiotics important to human medicine in its U.S. restaurants; and serving 100 percent cage-free eggs across its menu in the U.S., among other things. The brand is also giving employees and customers the opportunities they need to turn their dreams into goals through its Live Más Scholarship, which provided $1 million to $2 million in funding per year for more than 400 students in 2016 and 2017. For more information and to view Yum! Brands’ 2017 Global Citizenship & Sustainability Report, visit citizenship.yum.com, or join the experts at Yum! Brands on Tuesday, July 31, 2018 at 12pm ET to discuss the #YumRecipeforGood in a Twitter Chat hosted by @TriplePundit. Visit here to for details. Join the conversation at Facebook.com/yumbrands and @yumbrands on Twitter using the hashtag #YumRecipeforGood.